View cart “Contact Magazine” has been added to your cart. as much as you can, for there is still more. In the Confraternity, spurred on by this desire to praise God we ponder Our Blessed Lord as the Eternal High Priest Who offered the perfect sacrifice of praise, and Who calls everyone to become, in Him, a “priestly people”, called to worship in spirit and in truth. We have received a special call: to live for the adoration and praise of God and to draw others to join us in this worship, the Churchless Millions. We share in the work of Christ the Priest especially by bringing the Churchless to know, love and worship Almighty God. By promoting devotion to the Priesthood of Jesus, we also help all the faithful to realize their true vocation to worship God, by living their share in the Priesthood of Jesus, “through Him, with Him and in Him”. One way we spread this devotion to Christ the Priest is by our sermons and writings. But we have now another way. The use of art, through sacred images and statues is a powerful way of reaching people’s hearts. The words of the late Pope John Paul II, above, emphasise how much of an influence beautiful images of the divine can have, how much they can inspire our imperfect human hearts. The Church exhorts us to make use of holy images: ‘Following the divinely inspired teaching of our holy Fathers and the tradition of the Catholic Church (for we know that this tradition comes from the Holy Spirit who dwells in her) we rightly define with full certainty and correctness that, like the figure of the precious and life-giving cross, venerable and holy images of our Lord and God and Saviour, Jesus Christ, our inviolate Lady, the holy Mother of God, and the venerated angels, all the saints and the just, whether painted or made of mosaic or another suitable material, are to be exhibited in the holy churches of God, on sacred vessels and vestments, walls and panels, in houses and on streets.’ (Catechism of the Catholic Church 1161). How many times have we heard the old adage ‘a picture tells a thousand words’ and considered it to be true? And now, having gazed on the picture of the statue of Christ the Priest, you can be assured that there is a worthy story behind that picture. The Confraternity of Christ the Priest has been a religious family in Australia for over 60 years, celebrating this anniversary of foundation in 2014. Our unique apostolate focuses on the Eternal Priesthood of Jesus Christ and until recently, aside from a single and much reproduced picture of Christ the Priest, we had no statue by which to represent the priesthood of Christ to the Church at large. It was upon viewing a statue of Christ the Good Shepherd, created by the Rogate Center in Manila, that Fathers Gerard Ryan CCS and Thomas Casanova CCS decided to look into the possibility of designing and producing a statue for the Confraternity. This process of designing an image to be constructed into a statue proved to be difficult. Much prayer and consideration went into the design. For how were they to create an image of the Divine Lord; how were they to define the glory and majesty of God? Eventually they agreed that Jesus should be depicted with pierced hands and feet so as to signal his offices of both the Eternal High Priest and Victim. That he should be robed in contemporary priestly vestments in order to remind us that he is the Priest of every Mass – that the parish priest we see is in persona Christi – and re-presents the sacrifice of Calvary. The cross depicted on the vestments should the symbol of the Confraternity of Christ the Priest. The symbol is of ‘the Cross of Christ planted atop the globe of the world. Upon the cross are set the host and chalice. The explanation of this symbol is that the world can find meaning and happiness and salvation only through the redemptive sacrifice of Christ the Priest upon the Cross.’ (‘Contact’ August September, 1969). Finally, they decided that Jesus’ eyes should be raised to Heaven because He is ‘ever living to intercede’ for us, as we are assured in the Letter to the Hebrews. The task of creating drawn images of these ideas was given to Mrs. Emily Shaw, who found the design of such a unique depiction of Our Lord rather daunting. A photo of Fr Ryan in vestments was also sent to Rogate to help their artist capture our vision. Several images with various design alterations were created in readiness for Fr Casanova’s trip to the Philippines to visit the Congregation of the Rogationists. It was this Rogate center in Parañaque that Fr Casanova visited in the Philippines. He took the opportunity to meet with the artist, Romeo Castillo, and assist him in capturing something of the design, and the reason behind the design, of the statue of Christ the Priest. 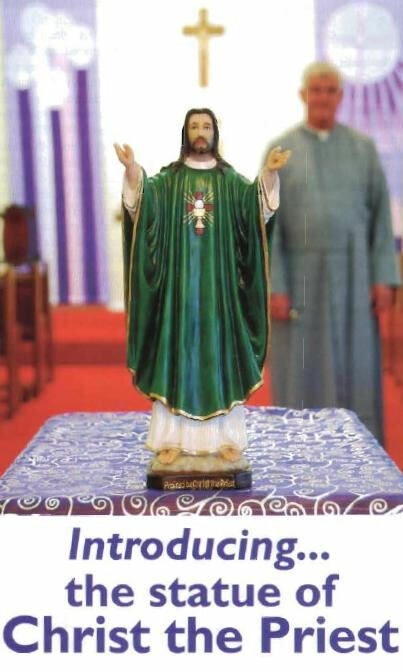 Many months later, the Confraternity of Christ the Priest was able to promote devotion to Christ the Eternal High Priest, by way of a unique and beautiful 12 inch resin statue. In addition to the original design, around the base are the words “Praised be Christ the Priest”, “Christ Priest and Victim” and “Living to Intercede”. 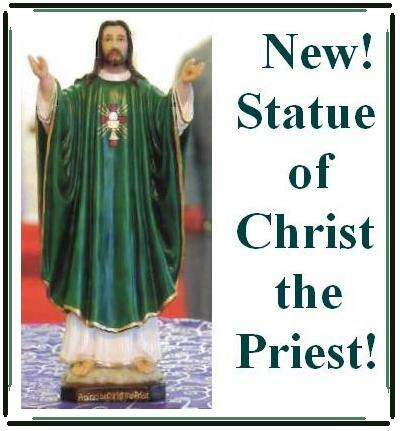 In keeping with the Church’s encouragement to keep statues in our churches, parishes and homes the Confraternity are offering these statues for purchase. (ask us about postage discount for multiple statues). Phone 02 6931 3601, or fill out our contact form. 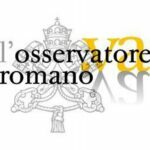 They will be a blessing for every Catholic home and also for priests who share in a special way in the Our Lord’s own Priesthood and wish to imitate Him in their daily lives. The Confraternity of Christ the Priest are praying that through this image, more people will thank Our Lord for giving His life for us as Priest and Victim, and many will realise that they also are called to worship in Spirit and in truth, and to offer their own lives as a pleasing sacrifice to God, uniting their hearts, minds and actions with Jesus Christ the Priest. Praised be Christ the Priest, for ever and ever!